Any journalists reporting on the local elections may like to try out this interactive Google map tutorial for visualising council ward boundaries, on the Online Journalism Blog. The guide to creating a ward map was created by journalist Daniel Bentley. If you have a tip you would like to submit to us at Journalism.co.uk email us using this link– we will pay a fiver for the best ones published. This entry was posted in Data, Online Journalism and tagged Data journalism, journalism tips, Mapping, Online Journalism blog, tips on May 3, 2012 by Rachel Bartlett. Yesterday Paul Bradshaw shared his experience of running a blog entirely through a Facebook Page for four weeks, offering his thoughts on the month-long project in a post back on his Online Journalism Blog. In the early days of the experiment he had already started noticing the pros and cons of the platform, from the impact of the 400 character limit on what he could write, to the possibilities presented by being able to post from a mobile phone via email. The most popular posts during that month were simple links that dealt with controversy. With most blogging it’s quite easy to ‘just do it’ and then figure out the bells and whistles later. With a Facebook Page I think a bit of preparation goes a long way – especially to avoid problems later on. Although Vadim Lavrusik pointed out that you can find the Facebook Page through Google or Facebook’s own search, individual posts are rather more difficult to track down. The lack of tags and categories also makes it difficult to retrieve updates and notes – and highlights the problems for search engine optimisation. So, in short, while it’s great for short-term traffic, it’s bad for traffic long term. 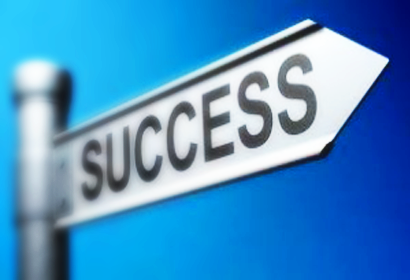 It’s better for ongoing work and linking than for more finished articles. And his overall conclusion: Facebook should be used as “one more step in a distributed strategy” not in isolation. There’s also Smart Twitter for Pages which publishes page updates to Twitter; or you can use Facebook’s own Twitter page to link pages to Twitter. There was also some interesting research published this month which looked at Facebook fan pages and engagement. According to the 10,000 Words blog a study was carried out by Facebook research company PageLever which suggested that as a fan page’s membership grows, engagement and page-views-per-member actually decreases. From a purely aesthetic perspective, looking at the Fan Page and seeing that 10,000 people like your business on Facebook has its benefits. It makes you feel good. But when it comes time to talk value, it can be a bit more difficult to find the silver lining. You might have 1,000 Likes on Facebook, but if you’re averaging around five Likes or comments per post, then only 0.005 per cent of your users saw the post and cared enough about it to respond. This entry was posted in Editors' pick, Social media and blogging and tagged 10000 Words, blogging, engagement, Facebook, fan pages, Online Journalism blog, Paul Bradshaw, social media on June 28, 2011 by Rachel Bartlett. The New York Times paywall: what do people think? 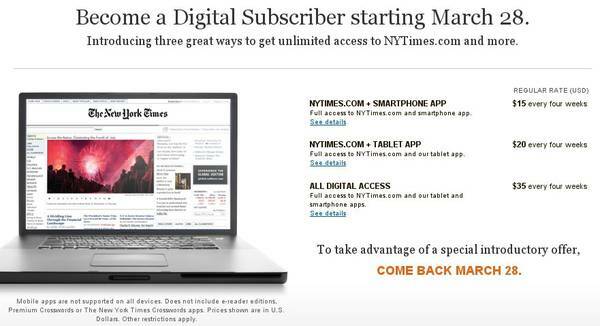 So what have people been saying about the New York Times paywall (or fence, ramp, meter, porous paywall, nagwall or even ‘metered-access digital subscription system’, if you prefer)? It was announced yesterday that the paywall is going up on March 28. A metered system will allow readers to access 20 articles a month for free and it will be free for those who land on a page via a link from Twitter, Facebook, a search engine or blog. So, how much money will it make? paidContent has done the maths and reckons around 500,000 people will sign up, generating $100 million. And what is everyone saying about it? Online Journalism Blog is encouraged that the NYT model will work, as it recognises the importance of distribution (via Twitter and Facebook) and balancing quantity with quality for advertisers. Newsonomics thinks the timing is good, coinciding with the launch of the iPad 2 in America. The Nieman Journalism Lab says the NYT faces seven tests if it is to succeed. The Online Journalism Review is encouraged by the business model but thinks customers will go elsewhere for news. 10,000 Words looks at paywall models and compares NYTs strategy with the Wall Street Journal and Newsday. Poynter takes a look at tweets on the subject (including some quite funny ones like “If the NYT paywall gets torn down, Reagan will probably get credit”). The Cutline looks at what readers of the NYT think of it (not much, judging by many of the comments). One of the most interesting points is made by TechCrunch, which says the pricing structure is unfair and “discriminates by device” (The NYT’s charging $15 a month for web access, $20 to add smartphones or a an iPad, and $35 for all). In other words, if you are shelling out $20 a month for the iPad subscription, and you want to also be able to read it on your iPhone, you basically have to pay the full smartphone subscription price, or an additional $15 a month. That seems like a rip-off. A digital subscription should be a digital subscription, and it shouldn’t matter what kind of computer you use to read the paper on. But okay, the iPad and other tablets are different, I might pay a little more for the tablet apps. But once I step up to pay the New York Times $20 a month for its iPad app, that should include access via the iPhone app as well. Scripting also makes an excellent point about “frequent linkers”, who will have to pay to deliver readers to the NYT. They did something smart in not charging readers who get to a Times story through a link from a blog post or tweet. But – since I am a frequent linker, I wonder why I should pay to read their site, when I’m delivering flow to them. How does that equation balance by me paying them? Maybe they should pay me? Seriously. Elsewhere on paidContent, Bill Grueskin, former managing editor of the subscription-based Wall Street Journal Online, predicts the NYT can expect a big number of early subscribers. He is also one of many to point out that there are ways over the wall. According to sources close to the situation, the 20-story limit can be breached if you access the site from multiple devices, and/or if you delete your cookies. In other words, suppose you hit the wall on your PC. Then move to your laptop, where you’ll get another 20 stories. Delete your cookies on any computer, and the clock goes back to zero. Roy Greenslade has also been reading about how to jump over the wall: by finding a story, pasting the headline into a search engine and accessing the linked story for free. Perhaps the most revolutionary way to sneak around the wall is this idea is reported in the the Atlantic. So, cheapskates, meet @freenyt, a three-hour old Twitter feed that intends to tweet all the Times stories. Maybe we can even think of the Times paywall as akin to old-school shareware that didn’t force you to upgrade but just hit you with a nag screen (a nagwall?). This entry was posted in Comment, Online Journalism, Social media and blogging, Traffic and tagged bill grueskin, New York Times, NYT, Online Journalism blog, pay walls, paywalls on March 18, 2011 by Sarah Marshall. OJR: Promoted tweets – the AdWords for live news? Al Jazeera has started paying for tweets to promote its English-language Egypt coverage in the US. Paul Bradshaw’s Online Journalism Blog compares the move to newspapers using Google Adwords to drive traffic to their sites – except that the sponsored tweets can be replied to and re-tweeted just like any other. Twitter’s media team says Riyaad Minty, head of social media at Al Jazeera English, is operating the campaign like a news desk. It also claims that Twitter has helped drive Al Jazeera site traffic up by 2,500 per cent in the last month and that the English language version is on course to triple its number of followers. See the full story on Online Journalism Blog at this link. This entry was posted in Editors' pick, Social media and blogging, Traffic and tagged Al Jazeera, egypt protests, Online Journalism blog, Twitter on February 9, 2011 by Caroline White. Paul Bradshaw’s Hyperlocal Voices series takes a look at the SE1 site this week. The site has been running for 12 years and boasts half a million visits every month. Well worth a read for anyone in the business of hyperlocal journalism. In the 1970s and 1980s there was a community newspaper called ‘SE1’ but that had died out, and our neighbourhood was just a small part of the coverage areas of the established local papers (South London Press and Southwark News). We saw that there was a need for high quality local news and information and decided that together we could produce something worthwhile. This entry was posted in Editors' pick, Hyperlocal and tagged Hyperlocal, hyperlocal voices, James Hatts, Online Journalism blog, Paul Bradshaw, se1 on January 4, 2011 by Joel Gunter. Writing on the Online Journalism Blog, Paul Bradshaw shares key points from the internet section of Ofcom’s latest report on The Communications Market 2010, analysing the implications of each for online publishers. 1: Mobile is genuinely significant: 23 per cent of UK users now access the web on mobile phones (but 27 per cent still have no access to the web on any device). Implication: We should be thinking about mobile as another medium, with different generic qualities to print, broadcast or web, and different consumption and distribution patterns. This entry was posted in Editors' pick, Mobile, Online Journalism and tagged Mobile, Ofcom, Online Journalism blog, Online publishing, Paul Bradshaw on August 19, 2010 by Joel Gunter. Online journalism expert Paul Bradshaw gives a detailed post on his experiences of a recent Hacks and Hackers day in Birmingham organised by Scraperwiki, experiences which he claims will “challenge the way you approach information as a journalist”. Talking through the days events, Bradshaw observes how journalists had to adapt their traditional skills for finding stories. Developers and journalists are continually asking each other for direction as the project develops: while the developers are shaping data into a format suitable for interpretation, the journalist might be gathering related data to layer on top of it or information that would illuminate or contextualise it. This made for a lot of hard journalistic work – finding datasets, understanding them, and thinking of the stories within them, particularly with regard to how they connected with other sets of data and how they might be useful for users to interrogate themselves. It struck me as a different skill to that normally practised by journalists – we were looking not for stories but for ‘nodes’: links between information such as local authority or area codes, school identifiers, and so on. Finding a story in data is relatively easy when compared to a project like this, and it did remind me more of the investigative process than the way a traditional newsroom works. His team’s work led to the creation of a map pinpointing all 8,000 GP surgeries around the UK, which they then layered with additional data enabling them to view issues on a geographical measure. This entry was posted in Data, Events, Online Journalism and tagged Data journalism, Hacks and Hackers day, Online Journalism blog, Paul Bradshaw, programming, scraperwiki, web development on July 27, 2010 by Rachel Bartlett. 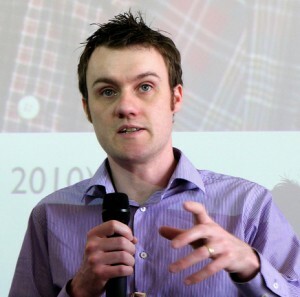 Online journalism innovator Paul Bradshaw has taken voluntary redundancy from his post as course leader for the online journalism MA at Birmingham City University, in what he says was a “complicated decision”. Bradshaw, who is also founder of the Online Journalism Blog, hopes he can now invest more time in his own projects, with immediate plans to develop his Help Me Investigate site. Bradshaw is also already working on two different books, his own on magazine editing which is set to be completed by the end of the year and another dedicated to online journalism, which he is contributing to with former FT.com news editor Liisa Rohumaa, likely to be out by early next year. On top of all that, he admits he may keep his toes in the teaching pool. This entry was posted in Data, Investigative journalism, Jobs, Recommended journalists and tagged birmingham city university, Data journalism, help me investigate, Online Journalism blog, Paul Bradshaw on July 20, 2010 by Rachel Bartlett. Really good round-up from Paul Bradshaw on the Online Journalism Blog of the case of Joe Neale, whose photo of a crime scene at Waterlook station was used by Sky News after Neale posted it to Twitter. Neale’s picture, which he submitted via Twitpic, was used by Sky for the story a couple of weeks ago without his knowledge. Using Twitter to raise the issue – and maintain pressure on Sky – and backing himself up with TwitPic’s terms of service, Neale has now been contacted by Sky, who have agreed to pay for use of the image. Fascinating to see Neale’s correspondence with Sky in the open via Twitter/the use of the service to campaign. The ultimately positive response from the Sky News Online team is also interesting and counter to the original act of using the photo – which suggests that mainstream media organisations still see social media as a free pool of content – as a comment on the OJB post suggests. This entry was posted in Editors' pick, Social media and blogging and tagged Joe Neale, mainstream media organisations, Online Journalism blog, online team, Paul Bradshaw, rights, Sky News, social media, the OJB post, TwitPic, Twitter, Waterlook station on August 20, 2009 by Laura Oliver. A call to action on behalf of the Online Journalism Blog, which with the help of Matt Wardman, is attempting to build a map of locally-focused blogs in the UK. You can submit the name of any local blogs you know of via an online form. Matt has some interesting thoughts on the opportunities for local news blogs in this post too. “I think group blogs with varied teams of contributors may be best placed to provide a decent level of coverage and draw a good readership, while competing effectively with other media outlets. That is a trend we have seen in the political blog niche over several years – the sites which have established themselves and maintain a position as key sites have developed progressively larger teams of editors, and provided a wider range of commentary and services,” he suggests. This entry was posted in Editors' pick, Social media and blogging and tagged blogs, Hyperlocal, Matt Wardman, media outlets, online form, Online Journalism blog, uk, United Kingdom on August 13, 2009 by Laura Oliver.